Some of the stuff in this article simply beggars belief….. like “they weren’t designed with decommissioning in mind”. Seriousy..? That is just mindboggling. And the decommissioning costs, at a time the world’s financial system is on the verge of collapse is similarly gobsmacking…… I’m so glad there are no nukes in Australia after reading that lot. By the start of 2012, according to the International Atomic Energy Agency, 138 commercial power reactors had been permanently shut down with at least 80 expected to join the queue for decommissioning in the coming decade – more if other governments join Germany in deciding to phase out nuclear power following the Fukushima disaster in Japan last year. And yet, so far, only 17 of these have been dismantled and made permanently safe. That’s because decommissioning is difficult, time-consuming and expensive. A standard American or French-designed pressurised water reactor (PWR) – the most common reactor design now in operation – will produce more than 100,000 tonnes of waste, about a tenth of it significantly radioactive, including the steel reactor vessel, control rods, piping and pumps. Decommissioning just a single one generally costs up to half a billion dollars. Decommissioning Germany’s Soviet-designed power plant at Greifswald produced more than half a million tonnes of radioactive waste. The UK’s 26 gas-cooled Magnox reactors produce similar amounts and will eventually cost up to a billion dollars each to decommission. That’s because they weren’t designed with decommissioning in mind. The many variations also mean that there is no agreed-upon standard for how to go about the process. If you want to decommission a nuclear power plant, you have three options. The first is the fastest: remove the fuel, then take the reactor apart as swiftly as possible, storing the radioactive material somewhere safe to await a final burial place. The second approach is to remove the fuel but lock up the reactor, letting its troublesome radioactive isotopes decay, which makes dismantling easier – much later. The third option is to simply entomb the reactor where it is. Even when the reactor can be dismantled, where do you put the radioactive waste? Even the least contaminated material – old overalls, steel heat exchangers and toilets – must be carefully separated and sent to specially licensed landfill sites. Not every country has such designated facilities. Intermediate-level waste, contrary to its name, is even more of a problem because it may require deep ground burial alongside the high-level spent fuel. In 1976, a British Royal Commission said no more nuclear power plants should be built until the waste disposal problems were resolved. Thirty-five years on, nothing much has changed. The Tooth Fairy Syndrome that I discussed in Part 2 is, in my view, the fundamental reason why those holding onto BAU will grab every piece of information that can possibly, superficially, back up their ideology and twist it to suit their viewa, generating much confusion in the process. It is also probably fair to say that the advocates of various versions of“energy transition” are not immune to this kind of syndrome when they remain oblivious to the issues explored in Parts 1 and 2. Is it possible to go beyond such confusion? The impact of the Tooth Fairy Syndrome is all the more felt in the main media and among politicians – with the end result that so many lay people (and many experts) end up highly confused about what to think and do about energy matters. Notably, we often encounter articles advocating, even sensationalising, various energy transition technologies or instead seeking to rubbish them by highlighting what they present as problematic issues without any depth of analysis. For example, a 2013 article from the Daily Mail was highlighted in recent discussions among energy experts as a case in point. The UK is indeed installing large numbers of subsidized, costly diesel generators to be used as back-up at times of low electricity supplies from wind turbines. This article presented this policy as very problematic but failed to set things in perspective about what such issues say about the challenges of any energy transition. In New Zealand, where I lived close to half of my life before a return to my dear Provence (De reditu suo mode, as a wink to an earlier post by Ugo) about 73% of electricity is deemed renewable (with hydro 60%, geothermal 10%, wind 3%, PVs about 0.1%); the balance being generated from gas and coal. There is a policy to achieve 90% renewables by 2025. Now, with that mix we have had for many years something like what the UK is building, with a number of distributed generators for emergency back-up without this being a major issue. The main differences I see with the UK are that (1) in NZ we have only about 5M people living in an area about half that of France (i.e. the chief issue is a matter of renewable production per head of population) and (2) the system is mostly hydro, hence embodying a large amount of energy storage, that Kiwi “sparkies” have learned to manage very well. It ensues that a few diesel or gas generators are not a big deal there. By contrast, the UK in my view faces a very big challenge to go “green”. At least since the early 1970s and the Meadows’ work, we have known that the globalised industrial world (GIW) is on a self-destructive path, aka BAU (Business as usual). We now know that we are living through the tail end of this process, the end of the Oil Age, precipitating what I have called the Oil Fizzle Dragon-King, Seneca style, that is, after a slow, relatively smooth climb (aka “economic growth”) we are at the beginning of an abrupt fall down a thermodynamic cliff. The chief issue is whole system change. This means thinking in whole systems terms where the thermodynamics of complex systems operating far from equilibrium is the key. In terms of epistemology and methods, this requires what in anthropology is called the “hermeneutic circle”: moving repeatedly from the particulars, the details, to the whole system, improving our understanding of the whole and from this going back to the particulars, improving our understanding of them, going back to considering the whole, and so on. Whole system replacement, i.e. going 100% renewable, requires a huge energy embodiment, a kind of “primitive accumulation” (as a wink to Marx) that presently, under the prevailing paradigm and technology set, is not feasible. Having the “Energy Hand” in mind (Figure 5), where does this required energy may come from in a context of sharp decline of net energy from oil and Red Queen effect, and concerning renewable, inverse Red Queen/cannibalisation effects? As another example of the importance of whole system thinking, Axel Kleidon has raised the question of the viability of very large-scale wind versus direct solar. Solely considering the performances and cost of this or that alternative energy technology won’t suffice. Short of addressing the complexities of whole system replacement, the situation we are in is some kind of “Apocalypse now”. The chief challenge I see is thus how to shift safely, with minimal loss of life (substantial loss of life there will be; this has become unavoidable), from fossil-BAU (and thus accessorily nuclear) to 100% sustainable, which means essentially, in one form or another, a direct solar-based society. We currently have some 17 TW of power installed globally (mostly fossil with some nuclear), i.e. about 2.3kW/head, but with some 4 billion people who at best are grossly energy stressed, many who have no access to electricity at all and only limited transport, in a context of an efficiency of global energy systems in the order of 12%. To address the Oil Fizzle Dragon-King and the Perfect Storm that it is in the process of whipping up, I consider that we need to move to 4kW/head for the whole population (assuming it levels off at some 8 billion people instead of the currently expected 11 billions), plus some 10TW additional to address climate change and other ecological energy related issues, hence about 50TW, 100% direct solar based, for the whole spectrum of energy uses including transport; preferably over 20 years. Standing where we now are, slightly past the edge of the thermodynamic cliff, this is my understanding of what’s required. In other words, going “green” and surviving it (i.e. avoiding the inverse Red Queen effect) means increasing our Energy Hand from 17 TW to 50 TW (as a rough order of magnitude), with efficiencies shifting from 12% to over 80%. To elaborate this further, I stress it again, currently the 17 TW do not even suffice to cater for the whole 7.3 billion global population and by a wide margin. Going “green” with the current “renewable” technology mix and related paradigm would mean devoting a substantial amount of those 17 TW to the “primitive accumulation” of the “green” system. It should be clear that under this predicament something would have to give, i.e. some of us would get even more energy stressed, and die, or as the Chinese and Indians have been doing for a while we would use much more of remaining fossil resources but then this would accelerate global warming and many other nasties. Alternatively we may face up to changing paradigm so as to rapidly steer away from global EROIs below 10:1 and global energy efficiency around 12%. This is the usual “can’t have one’s cake and eat it” situation writ large. Globally, I estimate very roughly that some 1.5 billion people, directly related to oil production, processing distribution and transport matters did require oil at above $100/bbl for their livelihood (including the Filipino domestics). I call them the Oil People. Most of them currently are unhappy and struggle; their “demand” for goods and services has dropped considerably since 2014. So all in all, whole system replacement (on a “do or die” mode) requires considering whole production chain networks from mining the ores, through making the metals, cement, etc., to making the machines, to using them to produce the stuff we require to go 100% sustainable, as well as the energy requirements of not only the Oil People but the full compendium of the Energy People involved, both the “fossil” ones and the “green” ones; while meanwhile we need to keep existing fossil-based energy systems going as much as possible. Very roughly the Energy People are probably in the order of 3 billion people (and it is not easy to convert a substantial proportion of the “fossil” ones to “green”, including their own related energy requirements – this too has a significant energy cost). This is where Figure 2, with the interplay of Red Queen and the inverse Red Queen, comes in. In my view at this whole system level we do have a major problem. Given the very short ti￼me window constraint, we can’t afford to get it wrong in terms of how to possibly getting out of there – we have hardly enough time to have one go at it. Indeed, under the sway of the Tooth Fairy (see Part 2) and an increasingly asthmatic Red Queen, we no longer have 35 years, (say up to around 2050). We have at best 10 years, not to debate and agonise but to actually do, with the next three years being key. The thermodynamics on this, summarised in Part 1, is rock hard. This timeframe, combined with the Oil Pearl Harbor challenge and the inverse Red Queen constraints, means in my view that none of the current“doings” renewable-wise can cut it. In fact much of these stand to make matters worse – I refer here to current interactions between efforts at going green largely within the prevailing paradigm and die hard BAU efforts at keeping fossils going, as perhaps exemplified in the current UK policies discussed earlier. Notwithstanding its apparent power, the GIW is in fact extremely fragile. It embodies a number of very weak links in its networks. I have highlighted the oil issue, an issue that defines the overall time frame for dealing with “Apocalypse now”. In addition to that and to climate change, there are a few other challenges that have been variously put forward by a range of researchers in recent years, such as fresh water availability, massive soil degradation, trace pollutants, degradation of life in oceans (about 99% of life is aquatic), staple food threats (e.g. black stem rust, wheat blast, ground level ozone, etc. 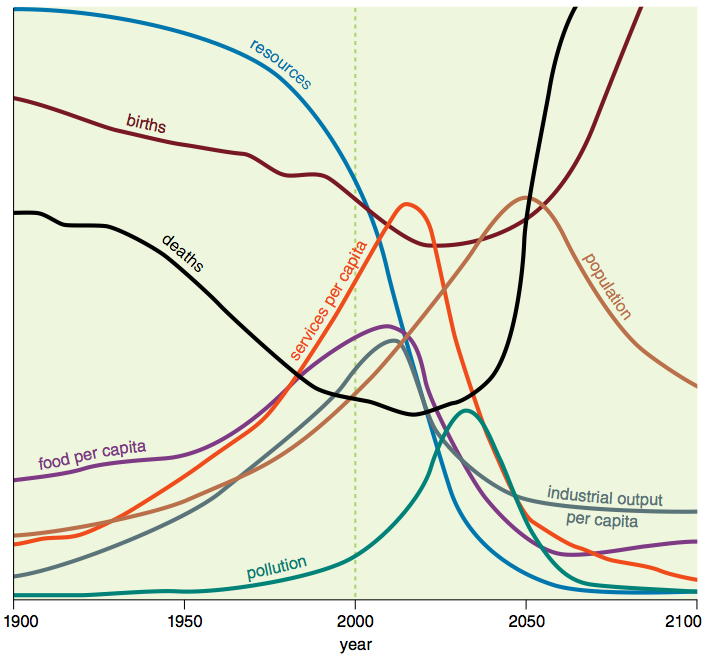 ), loss of biodiversity and 6th mass extinction, all the way to Joseph Tainter’s work concerning the links between energy flows, power (in TW), complexity and overshoot to collapse. These weak links are currently in the process of breaking or are about to break, the breaks forming a self-reinforcing avalanche (SOC) or Perfect Storm. All have the same key timeframe of about 10 years as an order of magnitude for acting. All require a fair “whack” of energy as a prerequisite to handling them (the “whack” being a flexible and elastic unit of something substantial that usually one does not have). Recent research shows that sensitivity to climate forcing has been substantially underestimated, meaning that we must expect much more warming in the longer term than touted so far. This further exacerbates what we already knew, namely that there is no such thing as a “carbon budget” of fossils the GIW could still burn, and no way of staying below the highly political and misleading 2oC COP21 objective (Figure 6). The 350ppm CO2 equivalent advocated by Hansen et al. is a safe estimate – a boundary crossed in the late 1980s, some 28 years ago. So the reality is that we can’t escape actually extracting CO2 from the atmosphere, somehow, if we want to avoid trying to survive in a few mosquito infested areas of the far north and south, while some 80% of the planet becomes non-habitable in the longer run. Direct Air Capture of atmospheric CO2 (DAC) is something that also requires a fair “whack” of energy, hence the additional 10TW I consider is required to get out of trouble. The “Brexit” saga is perhaps the latest large-scale demonstration of cognitive failure in a very long series. That is to say, the failure on the part of decision-making elites to make use of available knowledge, experience, and expertise to tackle effectively challenges within the timeframe required to do so. Cognitive failure is probably most blatant, but largely remaining unseen, concerning energy, the Oil Fizzle DK and matters of energy returns on energy investments (EROI or EROEI). What we can observe is a triple failure of BAU, but also of most current “green” alternatives (Figure 7): (1) the BAU development trajectory since the 1950s failed; (2) there has been a failure to take heed of over 40 years of warnings; and (3) there has been a failure to develop viable alternatives. However, although I am critical of aspects of recent evaluations of the feasibility of going 100% renewable, I do think it remains feasible with existing knowledge, no “blue sky” required, i.e. to reach in the order of 50TW 100% solar I outlined earlier, but I also think that a crash on the cliff side of the Seneca is no longer avoidable. In other words I consider that it remains possible to partly retrieve the situation while the GIW crashes so long as enough people do realise that one can’t change paradigm on the down side as one may do on the upside of a Seneca, which presently our elites, in full blown cognitive failure mode, don’t understand. To illustrate this matter further and highlight why I consider that production EROIs well above 30:1 are necessary to get us out of trouble consider Figure 8. This is expanded from similar attempts by Jessica Lambert et al., to perhaps highlights what sliding down the thermodynamic cliff entails. Charles Hall has shown that a production EROI of 10:1 corresponds roughly to an end-user EROI of 3.3:1 and is the bare minimum for an industrial society to function. In sociological terms, for 10:1 think of North Korea. 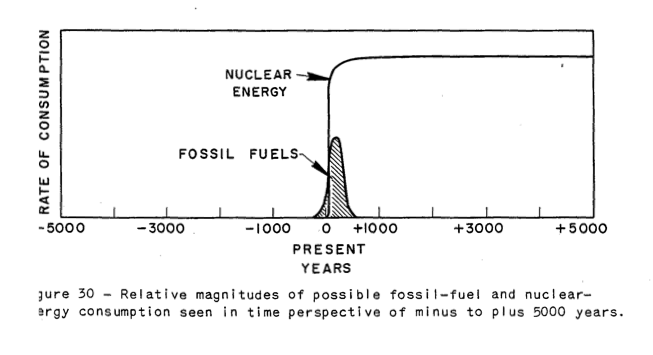 As shown on Figure 7, currently I know of no alternative, either unconventional fossils based, nuclear or “green” technologies with production EROIs (i.e. equivalent to the well head EROI for oil) above 20:1; most remain below 10:1. I do think it feasible to go back above 30:1, in 100% sustainable fashion, but not along prevalent modes of technology development, social organisation, and decision-making. So prevailing cognitive failure brings us back to Bohm’s “enquiry into the appropriateness of the question”. In conclusion of a 2011 paper, Joseph Tainter raised four questions that, in my view, squarely address such an enquiry (Figure 9). To date those four questions remain unanswered by both tenants of BAU and advocates of going 100% renewable. We are in an unprecedented situation. As stressed by Tainter, no previous civilisation has ever managed to survive the kind of predicament we are in. However, the people living in those civilisations were mostly rural and had a safety net, in that their energy source was 100% solar, photosynthesis for food, fibre and timber – they always could keep going even though it may have been under harsh conditions. We no longer have such a safety net; our entire food systems are almost completely dependent on that net energy from oil that is in the process of dropping to the floor and our food supply systems cannot cope without it. Figure 10 summarises how, in my view, Tainter’s four questions, his analyses and mine combine to define the unique situation we are in. If we are to avoid sliding all the way down the thermodynamic cliff, we must shift to a new “energy pool”. In this respect, dealing with the SOC-like Perfect Storm while carrying out such a shift both excludes “shrinking”our energy base (as many “greens” would have it) and necessitates abandoning the present highly wasteful energy use paradigm – hence the shift from 17TW fossil to 50TW 100% solar-based and with over 80% useful uses of energy that I advocated earlier, over a 20 to 30 years timeframe. Figure 10 – Ready to jumping into a new energy pool? (3) innovations concerning the human psyche, i.e. how we think, decide and act. Our predicament, as we have just begun to slide down the fossil fuels thermodynamic cliff, similarly requires such a nexus if we are to succeed at a new “energy pool shift”. Just focusing on thermodynamics and technology won’t suffice. The kind of paradigm change I keep referring to integrates technology, social innovations and innovation concerning the human psyche about ways of avoiding cognitive failure. This is a lot to ask, however it is necessary to address Tainter’s questions. This challenge is a measure of the huge selection pressure humankind managed to place itself under. Presently, I see a lot going on very creatively in all these three intimately related domains. Maybe we will succeed in making the jump over the cliff? Dellingpole, James, 2013, “The dirty secret of Britain’s power madness: Polluting diesel generators built in secret by foreign companies to kick in when there’s no wind for turbines – and other insane but true eco-scandals”, in The Daily Mail, 13 July. As another example, Axel Kleidon has shown that extracting energy from wind (as well as from waves and ocean currents) on any large scale would have the effect of reducing overall free energy usable by humankind (free in the thermodynamic sense, due to the high entropy levels that these technologies do generate, and as opposed to the direct harvesting of solar energy through photosynthesis, photovoltaics and thermal solar, that instead do increase the total free energy available to humankind) – see Kleidon, Axel, 2012, How does the earth system generate and maintain thermodynamic disequilibrium and what does it imply for the future of the planet?, Max Planck Institute for Biogeochemistry, published in Philosophical Transaction of the Royal Society A, 370, doi: 10.1098/rsta.2011.0316. E.g. Murray and King, Nature, 2012. This label is a wink to the Sea People who got embroiled in the abrupt end of the Bronze Age some 3,200 years ago, in that same part of the world currently bitterly embroiled in atrocious fighting and terrorism, aka MENA. Tainter, Joseph, 1988, The Collapse of Complex Societies, Cambridge University Press; Tainter, Joseph A., 1996, “Complexity, Problem Solving, and Sustainable Societies”, in Getting Down to Earth: Practical Applications of Ecological Economics, Island Press, and Tainter, Joseph A. and Crumley, Carole, “Climate, Complexity and Problem Solving in the Roman Empire” (p. 63), in Costanza, Robert, Graumlich, Lisa J., and Steffen, Will, editors, 2007, Sustainability or Collapse, an Integrated History and Future of People on Earth, The MIT Press, Cambridge, Massachusetts and London, U.K., in cooperation with Dahlem University Press. See for example Armour, Kyle, 2016, “Climate sensitivity on the rise”, www.nature.com/natureclimatechange, 27 June. For a good overview, see Spratt, David, 2016, Climate Reality Check, March. For example, Jacobson, Mark M. and Delucchi, Mark A., 2009, “A path to Sustainability by 2030”, in Scientific American, November. Hall, Charles A. S. and Klitgaard, Kent A., 2012, Energy and the Wealth of Nations, Springer; Hall, Charles A. S., Balogh, Stephen, and Murphy, David J. R., 2009, “What is the Minimum EROI that a Sustainable Society Must Have?” inEnergies, 2, 25-47; doi:10.3390/en20100025. See also Murphy, David J., 2014, “The implications of the declining energy return on investment of oil production” in Philosophical Transaction of the Royal Society A, 372: 20130126,http://dx.doi.org/10.1098/rsta.2013.0126. Guest Post by Louis Arnoux, republished from Ugo Bardi’s Cassandra’s Legacy blog…..
Let’s acknowledge it, the situation we are in, as depicted summarily in Part 1, is complex. As many commentators like to state, there is still plenty of oil, coal, and gas left “in the ground”. Since 2014, debates have been raging, concerning the assumed “oil glut”, concerning how low oil prices may go down, how high prices may rebound as demand possibly picks up and the “glut” vanishes, and, in the face of all this, what may or may not happen regarding “renewables”. However, in my view, the situation is not impossible to analyse rigorously, away from what may appear as common sense but that may not withstand scrutiny. For example, Part 1 data have indicated,that most of what’s left in terms of fossil fuels is likely to stay where it is, underground, without this requiring the implementation of difficult to agree upon resource management policies, simply because this is what thermodynamics dictates. Here it is important, in terms of system analysis, to differentiate between the global energy industry (say, GEI) and the GIW. The GEI bears the brunt of thermodynamics directly, and within the GEI, the oil industry (OI) is key since, as seen in Part 1, it is the first to reach the thermodynamics limit of resource extraction and, since it conditions the viability of the GEI’s other components – in their present state and within the remaining timeframe, they can’t survive the OI’s eventual collapse. On the other hand, the GIW is impacted by thermodynamic decline with a lag, in the main because it is buffered by debt – so that by the time the impact of the thermodynamic collapse of the OI becomes undeniable it’s too late to do much about it. Until 2012, the determining price driver was the total energy cost incurred by the OI. Until then the GIW could more or less happily sustain the translation of these costs into high oil prices, around or above $100/bbl. This is no longer the case. Since 2012, the determining oil price driver is what the GIW can afford to pay in order to still be able to generate residual GDP growth (on borrowed time) under the sway of a Red Queen that is running out of thermodynamic “breath”. I call the process we are in an “Oil Pearl Harbour”, taking place in a kind of eerie slow motion. This is no longer retrievable. 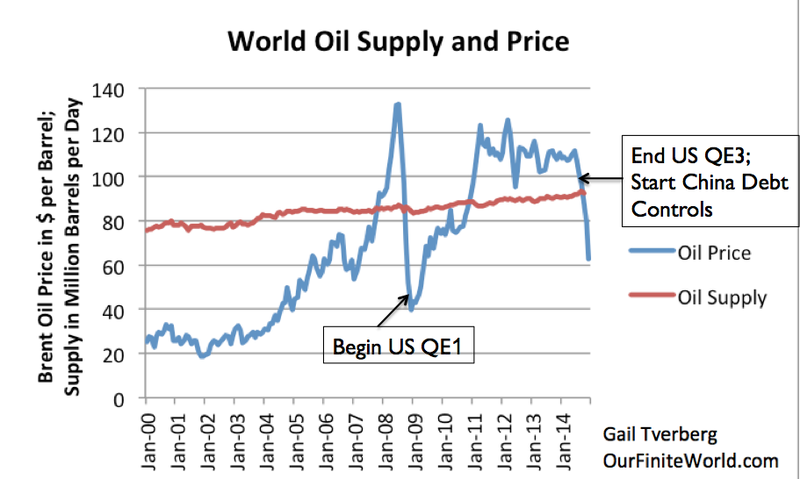 Within roughly ten years the oil industry as we know it will have disintegrated. The GIW is presently defenceless in the face of this threat. In the longer run, the end effect of the Oil Fizzle DK is likely to be an abrupt decline of GHG emissions. However, the danger I see is that meanwhile the GEI, and most notably the OI, is not going to just “curl up and die”. I think we are in a“die hard” situation. Since 2012, we are already seeing what I call a Big Mad Scramble (BMS) by a wide range of GEI actors that try to keep going while they still can, flying blind into the ground. The eventual outcome is hard to avoid with a GEI operating with only about 12% energy efficiency, i.e. some 88% wasteful current primary energy use. The GIW’s agony is likely to result in a big burst of GHG emissions while net energy fizzles out. The high danger is that the old quip will eventuate on a planetary scale: “the operation was successful but the patient died”… Hence my call for “enquiring into the appropriateness of the question” and for systemic thinking. We are in deep trouble. We can’t afford to get this wrong. It is not surprising that this claim is regarded as plausible, because technology does constantly achieve miraculous breakthroughs, and publicity is frequently given to schemes that are claimed could be developed to solve this or that problem. However there is a weighty case that technical advance will not be able to solve the major global problems we face. The Simpler Way view is that technical advances cannot solve the big global problems and therefore we must change to lifestyles and social systems which do not generate those problems. This could easily be done if we wanted to do it, and it would actually enable a much higher quality of life than most of us have now in consumer society. But it would involve abandoning the quest for affluent lifestyles and limitless economic growth…so it is not at all likely that this path will be taken. The problems are already far too big for technical advance alone to solve. Most people have little idea how serious the main problems are, or how far beyond sustainable levels we are. Here are some indicators of how far we have exceeded the limits to growth. The 2007 IPCC Report said that if greenhouse gas emissions are to be kept to a “safe” level they must be cut by 50-80% by 2050, and more after that. The 50% figure would mean that the average American or Australian would have to go down to under 5% of their present per capita emission rate. Some argue that all emissions should cease well before 2030. (Anderson and Bows, 2009, Hansen, 2008, Spratt, 2014. By 2050 the amount of productive land on the planet per capita will be 0.8 ha (assuming we will stop damaging and losing land.) The present amount required to give each Australian their lifestyle is 8 ha. This means we are 10 times over a sustainable amount, and there is not the slightest possibility of all the world’s people ever rising to anywhere near our level. Australians use about 280 GJ of energy per capita p.a. Are we heading for 500 GJ/person/y by 2050? If all the world’s expected 9.7 billion people were to live as we live world energy supply would have to be around 4,500 EJ/y…which is 9 times the present world energy production and consumption. Almost all resources are scarce and dwindling. Ore grades are falling, and there have been food and water riots. Fisheries and tropical forests are in serious decline. Yet only about one-fifth of the world’s people are using most of these; what happens when the rest rise to our levels? The World Wildlife Fund estimates that we are now using up resources at a rate that it would take 1.5 planet earths to provide sustainably. (WWF, 2014.) If 9.7 billion are to live as we expect to in 2050 we will need more than 20 planet earths to harvest from. Now add the absurdity of economic growth. These and many other facts and figures only indicate the magnitude of the present problems caused by over-production and over-consumption. To this alarming situation we must now add the fact that our society is committed to rapid and limitless increases in “living standards” and GDP; i.e., economic growth is the supreme goal. If we Australians have 3% p.a. economic growth to 2050, and by then all 9.7 billion people will have come up to the “living standards” we will have by then, the total amount of economic production in the world each year will be about 20 times as great as it is now. The present amount of production and resource use is grossly unsustainable, yet we are committed to economic system which will see these rates multiplied 20 times by 2050. 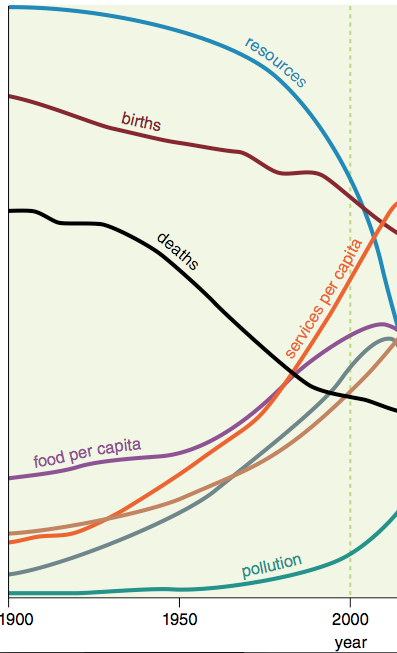 And note that most of the resources and ecosystems we draw on to provide consumer lifestyles are deteriorating. The WWF’s Footprint index tells us that at present we would need 1.5 planet Earth’s to provide the resources we use sustainably. So the Tech-fix advocate’s task is to explain how we might cope with a resource demand that is 20×1.5 = 30 times a currently sustainable level by 2050…and twice as much by 2073 given 3% p.a. growth. 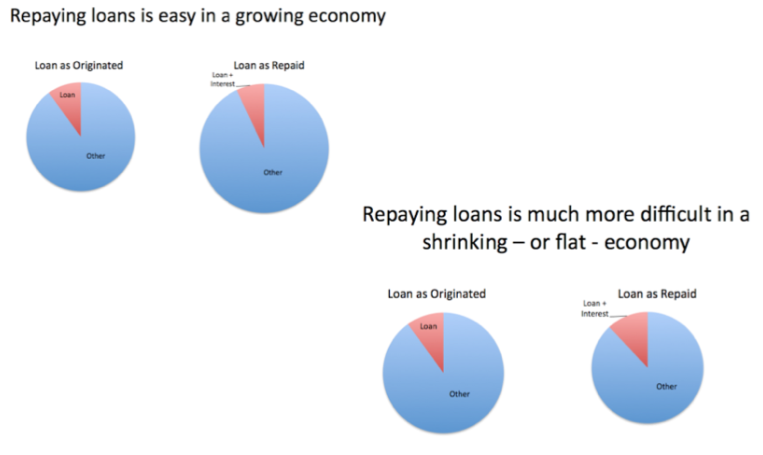 Huge figures such as these define the magnitude of the problem for technical-fix believers. We are far beyond sustainable levels of production and consumption; our society is grossly unsustainable, yet its fundamental determination is to increase present levels without limit. If technical advance is going to solve the problems caused by all that producing and consuming it must cut resource use and impacts by a huge multiple…and keep it down there despite endless growth. Now ask the tech-fix believer what precisely he thinks will enable this. At this point we usually find that the belief in tech–fix is nothing but a faith, and one that has almost no supporting evidence. Because technology has achieved many wonders it is assumed that it will come up with the required solutions, somehow. This is as rational as someone saying, “I have a very serious lung disease, but I still smoke five packs of cigarettes a day, because technical advance could come up with a cure for my disease.” This argument is perfectly true… and perfectly idiotic. If you are on a path that is clearly leading to disaster the sensible thing is to get off it. If technology does come up with solutions then it might make sense to get back on that path again. The tech-fix optimist should be challenged to show in detail what are the grounds for us accepting that solutions will be found, to each and every one of the big problems we face. What precisely might solve the biodiversity loss problem, the water shortage, the scarcity of phosphorus, the collapse of fish stocks, etc., and how likely are these possible beak-throughs? Does it not make better sense to change from the lifestyles and systems that are causing these problems, at least until we can see that we can solve the resulting problems? It should be stressed that the argument here is not to deny or undervalue the many astounding advances being made all the time in fields like medicine, astronomy, genetics, sub-atomic physics and IT, or to imply that these will not continue. The point is that technical advance is very unlikely to come up with ways that solve the resource and environmental problems being generated by affluent lifestyles. The argument is that when the magnitude of the task (above) and the evidence on the significance of technical advance for resource and ecological problems is considered (below), tech-fix faith is seen to be extremely unwarranted … and the solutions have to be sought in terms of shifting to a Simpler Way of some kind. Amory Lovins and Factor 4 or 5 reductions. For decades Amory Lovins has been possibly the best known of several people who argue that technical advances could cut resource use per unit of GDP considerably. He says we could in effect have 4 times the output with the same impact. (Von Weizacher and Lovins, 1997). But the above numbers make it clear that this is far from sufficient. If by 2050 we should cut ecological impact and resource use in half (remember footprint and other indices show this is far from enough), but we also increase economic output by 20, then we’d need a factor 40 reduction, not Factor 4…and resource demand would be twice as high in another 23 years if 3% growth continued. The factors limiting what technical advance can do. It is important to keep in mind that there are several factors which typically determine the gains a technical advance actually enables are well below those that seem possible at first. Engineers and economists make the following distinctions. “Technical potential.” This is what the technology could achieve if fully applied with no regard to cost or other problems. “Economic (or ecological) potential”. This is usually much less than the technical potential because to achieve all the gains that are technically possible would cost too much. For instance it is technically possible for passenger flights to be faster than sound, but it is far too costly. It would be technically possible to recycle all lead used, but it would be much too costly in dollars and convenience to do so. Some estimate that it would be technically possible to harvest 1,400 million ha for biomass energy per year, but when ecologically sensitive regions are taken out some conclude that the yield could only be 250 million ha or less. (World Wildlife Fund, 2010, p. 181.) The WWF study quotes Smeets and Faiij (2007) as finding that it would be technically possible for the world’s forests to produce another 64 EJ/y of biomass energy p.a., but Field, Campbelo and Lobell (2007) conclude that only 27 EJ/y can be obtained, under 2 per cent of the Smeets and Faiij figure. What are the net gains? Enthusiastic claims about a technical advance typically focus on the gains and not the costs which should be subtracted to give a net value. For instance the energy needed to keep buildings warm can be reduced markedly, but it costs a considerable amount of energy to do this, in the electricity needed to run the air-conditioning and heat pumps, and in the energy embodied in the insulation and triple glazing. The WWF Energy Report (2010) claims that big savings can be made in building heating and cooling, but their Figs. 3 – 11 and 3 – 12 show that although their measures would reduce heat used in buildings by 90%, electricity used would increase c. 50% (and there is no reference to what the embodied energy cost of manufacturing the equipment and insulation might be.) The graphs don’t seem to show any net reduction in building energy use. The Green Revolution doubled food yields, but only by introducing crops that required high energy inputs in the form of expensive fertilizers, seeds and irrigation. One result was that large numbers of very poor farmers went out of business because they couldn’t afford the inputs. Similarly, it is possible to solve some water supply problems by desalination, but only by increasing the energy and greenhouse problems. What is socially/politically possible? Then there are limits set by what people will accept. It would be technically possible for many people in Sydney to get to work by public transport, but large numbers would not give up the convenience of their cars even if they saved money doing so. The energy efficiency of American cars is much lower than what is technically possible, and in fact lower than it was decades ago … because many people want energy-intensive vehicles. Australians are now building the biggest and most energy wasteful houses in the world. A beautiful, tiny, sufficient mud brick house could be built for less than $10,000…but most people would not want one. These examples make it clear that the problems of over-consumption in many realms are mainly social rather than technical, and that they can’t be solved by technical advance. The essential tech-fix issue is to do with whether or not the problems can be solved by technical advances which allow us to go on living and consuming as we were before, or whether we must change to values and behaviour that don’t cause problems. The Jevons or “rebound” effect. Then there is the strong tendency for savings made possible by a technical advance to be spent on consuming more of the thing saved or something else. For instance if we found how to get twice the mileage per litre of petrol many would just drive a lot more, or spend the money saved on buying more of something else. The Indians have recently developed a very cheap car, making it possible for many more low income people to drive, consume petrol and increase greenhouse gases. So it is always important to recognise that an announced technical miracle breakthrough probably refers to its technical potential but the savings etc. that it is likely to enable in the real world will probably be well below this. Some evidence on technical advance in the relevant fields. Again the focus here is on fields which involve high resource or ecological impacts and demands, not on the many advances being made in fields like medicine or particle physics. It should not be assumed that in general rapid, large or continuous technical gains are being routinely made in the relevant fields, especially in crucial areas such as energy efficiency. Ayres (2009) notes that for many decades there have been plateaus for the efficiency of production of electricity and fuels, electric motors, ammonia and iron and steel production. The efficiency of electrical devices in general has actually changed little in a century (Ayres, 2009, Figs. 4.1 and 4.19, p. 127.) “…the energy efficiency of transportation probably peaked around 1960”. (p. 126), probably due to increased use of accessories. Ayres’ Fig. 4.21a shows no increase in the overall energy efficiency of the US economy since 1960. (p. 128.) He notes that reports tend to publicise particular spectacular technical advances and this can be misleading regarding long term average trends across whole industries or economies. There are two important areas where recent trends seem to run counter to this argument; the remarkable fall in the costs of PV panels and the advent of new batteries. However the significance of these is uncertain. The PV cost is largely due to latge subsidies, very cheap labour, and the general failure of the Chinese economy to pay ecological costs of production. (On the enormous difference the last factor makes see Smith, 2016.) Thus the real cost, and that which we will have to pay in future is likely to be much higher. (… the EIA thinks costs will probably rise before long. ), The significance of the new battery technology is clouded by the fact that costs would have to fall by perhaps two-thirds before they could be used for grid storage without greatly increasing the cost of power, and it is not likely that there is enough Lithium to enable grid level storage of renewable energy. The fundamentally important element in the tech-fix or ecomodernist position is the belief/claim that resource demand and ecological impact can be “decoupled” from economic growth, that is, that new ways will enable the economy to keep growing and “living standards”, incomes and consumption to continue rising without increasing resource use or environmental damage (or while keeping these down to sustainable levels.) The following passages deal with considerable evidence on decoupling and show this belief to be extremely implausible, to put it mildly. Most of the productivity growth that has taken place now seems to have been due not to technical advance but to increased use of energy. Previous analyses have not realized this but have analysed only in terms of labour and capital input “factors of production”. Agriculture is a realm where technical advance has been predominantly a matter of increased energy use. Over the last half century productivity measured in terms of yields per ha or per worker have risen dramatically, but these have been mostly due to even greater increases in the amount of energy being poured into agriculture, on the farm, in the production of machinery, in the transport, pesticide, fertilizer, irrigation, packaging and marketing sectors, and in getting the food from the supermarket to the front door, and then dealing with the waste food and packaging. Less than 2% of the US workforce is now on farms, but agriculture accounts for around 17% of all energy used (not including several of the factors listed above.) Similarly the “Green Revolution” has depended largely on ways that involve greater energy use. So when we examine the issue of productivity growth we find little or no support for the general tech-fix faith. It is not the case that technical breakthroughs are constantly enabling significantly more to be produced per unit of inputs. The small improvements in productivity being made seem to be largely due to changes to more energy-intensive ways, and energy itself is exhibiting marked deterioration in productivity (ie, as evident in its EROI.) Some analysts (e.g., Ayres, 2009, Ayres et al., 2013) believe that any gains occurring now will probably disappear with coming rises in energy scarcity and cost. Evidence on low past and present decoupling achievement. The historical record suggests that at best rates of decoupling materials and energy use from GDP have been very low or less than zero; i.e., some important measures show materials or energy use to be increasing faster than GDP. It is important not to focus on national measures such as “Domestic Materials Consumption” as these do not take into account materials in imported goods. For example the OECD (2015) claims that materials used within its countries has fallen 45% per dollar of GDP, but this figure does not take into account materials embodied in imported goods. When they are included rich countries typically show very low or worsening ratios. The commonly available global GDP (deflated) and energy use figures between 1980 and 2008 reveals only a 0.4% p.a. rise in GDP per unit of energy consumed. Tverberg () reproduces the common plot for global energy use and GWP, showing an almost complete overlay; i.e., no tendency for energy use to fall away from GWP growth. There is another consideration that makes the situation much worse. Over recent decades there has been a marked increase in the proportion of rich nation GDP that is made up of “financial” services. These stand for “production” that takes the form of key strokes that move electrons around. A great deal of it is wild speculation, making risky loans and making computer driven micro-second switches in “investments”. These operations deliver massive increases in income to banks and managers, commissions, loans, interest, consultancy fees. These make a big contribution to GDP figures. In one recent year 40% of US corporate profits came from the finance sector. It could be argued that this domain should not be included in estimates of productivity because it misleadingly inflates the numerator in the output/labour ratio. The enormous implications for energy demand. The main ecomodernist texts make clear that if the technical advances envisaged could not take place unless there was extremely large scale increase in the amount of energy produced. They look forward to shifting a large fraction of agriculture off land into intensive systems such as high rise greenhouses and acquaculture, massive use of desalination for water supply, processing lower grade ores, dealing with greatly increased amounts of industrial waste (especially mining waste), and constructing urban infrastructures for billions to live in as they propose shifting people from the land to allow more of it to be returned to nature. They do not think renewable energy sources can provide these quantities of energy, so their proposals would have to involve very large numbers of fourth generation nuclear reactors (which run on plutonium). How large? If 9 billion people were to live on the per capita amount of energy Americans now average, world energy consumption in 2050 would be around x5 (for the US to world average ratio) x10/7 (for population growth) times the present 550 EJ p.a., i.e., around 3,930 EJ. The nuclear generating capacity needed would be around 450 times as great as at present. The general “limits to growth” analysis of the global situation makes it clear that the baseline on which ecomodernist visions must build is not given by present conditions such as resource availability. As Steffen et al. (2015) and many others stress the baseline is one of not just deteriorating conditions, but accelerating deterioration. It is as if the ecomodernists are claiming that their A380 can be got to climb at a 60 degree angle, which is far steeper than it has ever done before, but at present it is in an alarming and accelerating decline with just about all its systems in trouble and some apparently beyond repair. The problem is the wild party on board, passengers and crew dancing around a bonfire and throwing bottles at the instruments, getting more drunk by the minute. A few passengers are saying the party should stop, but no one is listening, not even the pilots. The ecomodernist’s problem is not just about producing far more metals, it is about producing far more as grades decline, it is not just about producing much more food, it is about producing much more despite the fact that problems to do with water availability, soils, the nitrogen cycle, acidification, and carbon loss are getting worse. It can be argued that on many separate fronts halting the deteriorating trends is now unlikely to be achieved. Yet the ecomodernist wants us to believe that the curves can be made to cease falling and to rise dramatically, without abandoning the quests for affluence and growth which are responsible for their deterioration. Stopping the party is not thought to warrant consideration. This is not an argument against technology. Research and development and improving things are obviously important and in The Simpler Way vision we would have more resources going into technical research than we have now despite a much lower GDP, because we would have phased out the enormous waste of resources that occurs in consumer-capitalist society. But it is a mistake to think that the way to solve our problems is to develop better technology. That will not solve the problems, because they are far too big, and they are being generated by trying to live in ways that generate impossible resource demands. The big global problems have been caused by our faulty social systems and values. The solution is to develop ways and systems that don’t generate the problems, and this requires movement away from affluent, high energy, centralised, industrialised, globalised etc., systems and standards. Above all it requires a shift from obsession with getting rich, consuming and acquiring property. It requires a willing acceptance of frugality and sufficiency, of being content with what is good enough. Hundreds of years ago we knew how to produce not just good enough but beautiful food, houses, cathedrals, clothes, concerts, works of art, villages and communities, using little more than hand tools and crafts. Of course we should use modern technologies including computers (if we can keep the satellites up there) where these make sense. But we don’t need much high-tech to design and enjoy high quality communities. Ayres, R. U., The economic Growth Engine, Cheltenham, Elgar, 2009. Ayres, R. U., et al., 2013, ”The underestimated contribution of energy to economic growth”, Structural Change and Economic Dynamics, 27, 79 – 88. Berndt, E. R., (1990), “Energy use, technical progress and productivity growth: a survey of economic issues”, The Journal of Productivity Analysis, 2:, pp. 67-83. Canning, P. et al., (2010), Energy Use in the US Food System, USDA. Cleveland, C. J., R. Costanza, C. A. S. Hall, and R. K. Kaufmann “Energy and the U.S. economy: A biophysical perspective.” Science, 225: (1984), pp., 890-897. Field, C.B., Campbell, J.E. and Lobell, D.B. (2007), “Biomass energy: the scale of the potential resource”, Trends in Ecology and Evolution, Vol. 13 No. 2, pp. 65-72. K. Kaufmann, (2004), “A biophysical analysis of the energy/real GDP ratio: implications for substitution and technical change”, Ecological Economics , 6: pp. 35-56. K. Kaufmann, (2004), “The mechanisms for autonomous energy efficiency increases: A co-integration analysis of the US energy/GDP ratio”, Energy Journal , 25(1), pp. 63-86. Rockstrom, J., (2009) “A safe operating space for humanity”, Nature, 461:24 (Sept.), pp. 472 – 476. Schurr, and B. Netschert, (1960), Energy and the American Economy, 1850-1975, Baltimore, Johns Hopkins University Press. Spratt, D., (2014),The real budgetary emergency and the myth of ‘burnable carbon”, Climate Code Red, 22 May. Von Weizacker, E. and A. B. Lovins, (1997), Factor Four : Doubling Wealth – Halving Resource Use : A New Report to the Club of Rome, St Leondards, Allen & Unwin. World Wide Fund for Nature, (2011), The Energy Report, WWF and Ecofys.